Home / Old Try / Hey Punkin. Oh, hey Thanksgiving, what you got going on this year? Oh yeah? 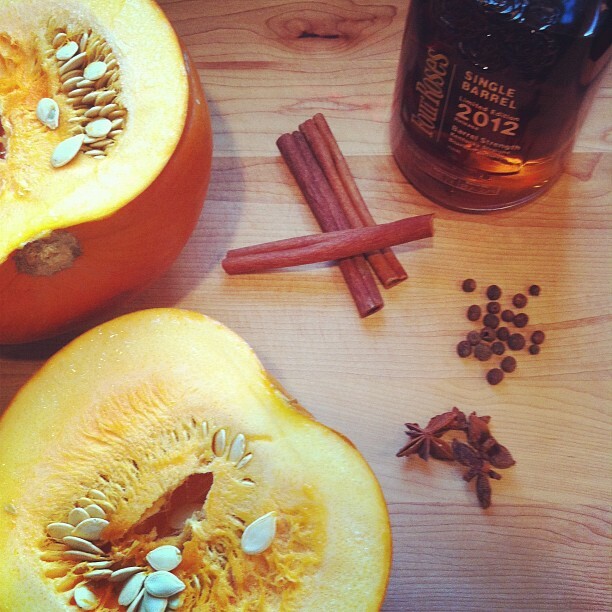 Spices, Pumpkin, Bourbon? That's cool. Say, why you so early? Found and tried this recipe thanks to Garden and Gun. It was pretty good, but I think it would've been even better if I'd gotten the right kind of pumpkin, and not just (honest to goodness) taken the pumkin off the neighbor's porch. They offered it up, sure, and they are getting a mason jar of this sweet, syrupy nectar, but I still think I could've manned up and driven someplace (a farm? Vermont?) rather than liberating a little guy who've been sitting there since well before Halloween. To be fair, I only had 35 minuted until LSU / Ole Miss kickoff, so I wasn't able to drive all over tarnations looking for a pumpkin (though thanks to Penzey's I got all the right spices). Get you the real Cinderella deal and lemme know how it is. Meanwhile, I've got about a half gallon of this stuff to mix with. Which won't be a problem come Thanksgiving. I also found that it was a little sweet (dangerous) for my taste when mixing it in the ratio they call out. Proceed as cautioned. Pour bourbon, pumpkin reduction, and bitters into a mixing glass and fill with ice. Stir generously. 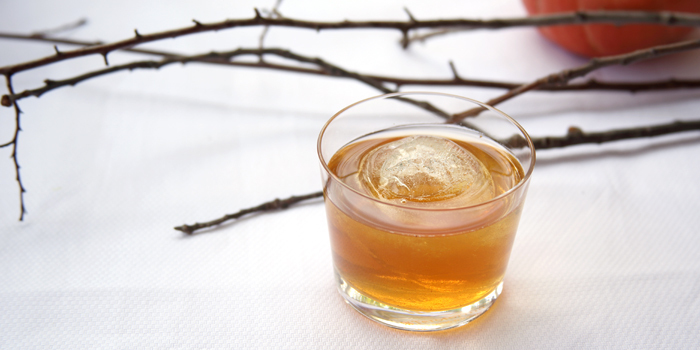 Strain into an old-fashioned glass with one large ice cube. Scoop out the pumpkin seeds and pulp, then peel and chop the pumpkin flesh into small one-inch cubes. Add all ingredients in a non-reactive pot and bring to a boil. Simmer for 40 minutes until reduced. Strain the mixture into a clean bowl and place in an ice bath to cool.